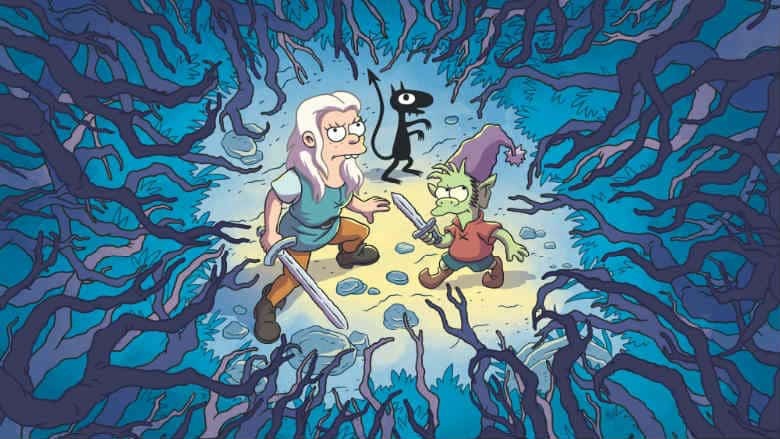 Disenchantment Hits Netflix in August from Simpson's Creator | Nerd Much? Animation enthusiasts surely recognize the art style of the famous Matt Groening. Groening has brought two of the most renowned animated series’ in history to our television – The Simpsons and Futurama. The voice talent attached to the show is pretty robust. Abbi Jacobson plays Princess Bean, Nat Faxon is her elf Elfo, and Eric Andre takes on the role of her demon Luci. Two of the best in the voice acting business, Joe DiMaggio and Billy West, are attached. As other plenty of other former Groening collaborators in Maurice LaMarche, Tress MacNeille, David Herman, Matt Berry, Jeny Batten, Rich Fulcher, Noel Fielding, and Lucy Montgomery. The animation for Disenchantment is being helmed by the same studio that worked on Futurama, Rough Draft Studios. The show is being produced by The ULULU Company and Netflix. Matt Groening and Josh Weinstein are set as executive producers. When Netflix greenlit the show, they ordered 20 episodes from Groening and his crew. The first 10 episodes of Disenchantment will hit the streaming platform on August 17th. Each episode of the show is expected to run between 20 and 25 minutes. It’s certainly a promising time for animation fans out there. Just two weeks ago Adult Swim ordered a whopping 70 episode renewal for their revered series Rick and Morty. And now in August we’re poised to get another adventure from one of the greatest animated talents of our time.